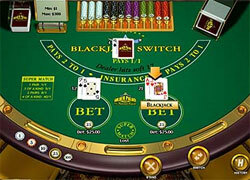 Blackjack Switch is the very interesting variation of this card game: it gives a gambler the opportunity to play with two hands of cards instead of one and get more chances for winning as a result. Moreover, when you play Blackjack Switch you main task is to choose the proper moment for switching cards between your two hands in order to receive the best result for yourself; it is not very easy to do though it seems to be so. As well as every other blackjack game, Blackjack Switch has its own strategy to follow in order to improve your chances for winning blackjack; this strategy is rather complicated actually but it describes the steps a gambler should perform during the game to switch cards properly. Remember, that not all hands should be split at Blackjack Switch: it is up to you whether to play two hands instead of one or not; sometimes it happens that a player decides to try winning this game with one initial hand, and the chances to do that really exist. 1. You can double after splitting. 2. You can double on any 2 cards. 3. A dealer always hits when s/he has a soft 17. 4. As for payouts, Blackjack is paid as even money, and the Insurance is paid as 2:1. Your hand is 4's + 4's, Ace + 2's, Ace + 3's, Ace + 4's, a hand of 5 - 8. These moves are the basic ones for Blackjack Switch; the best variant for you would be to get and learn the special blackjack strategy chart for this game: there you will find the proper step for every hand variations you can have during the game. Anyway, such strategy charts do not guarantee you winning at once: they just give you a hint but the final decision should be taken by yourself of course. Note! If you perform Blackjack Switch playing in online casino remember the fact that the basic strategy for this blackjack variation will not work here because the rules of online Switch differ from traditional ones. Moreover, the cards are reshuffled after every round when you play Blackjack Switch at Internet gambling houses.